Create galaxy drink coasters using resin, glitter and pigment powders. I'll show you how to in DIY craft tutorial! 1. Mix three ounces of resin, according to the package directions. 2. Mix a little bit of black, blue and purple resin pigment. 3. Mix well and then mix in glitter - I used a combination of chunky and fine glitters. 4. Pour into the cavities of the coaster mold. 5. Use a lighter to pop bubbles and allow it to cure for about and hour to an hour and a half. 6. Mix one ounce of resin and split into three cups. Mix different colored pigment powders into the resin (I used white, pink and blue). 7. Using your stir stick and skewer stick to add the resin to the partially cured resin. I sprinkled glitter on top of it too. Keep working it, until you get the look you want. 8. On the third coaster, I used nail polish on the coaster. Use cheap nail polish - I used metallic and glitter polishes. Paint it on to get the galaxy look. 9. Wait about and hour before mixing three more ounces of resin. 10. Pour over all of the coasters and pop bubbles with lighter. 11. Allow to cure a minimum of 12 hours. That's it! 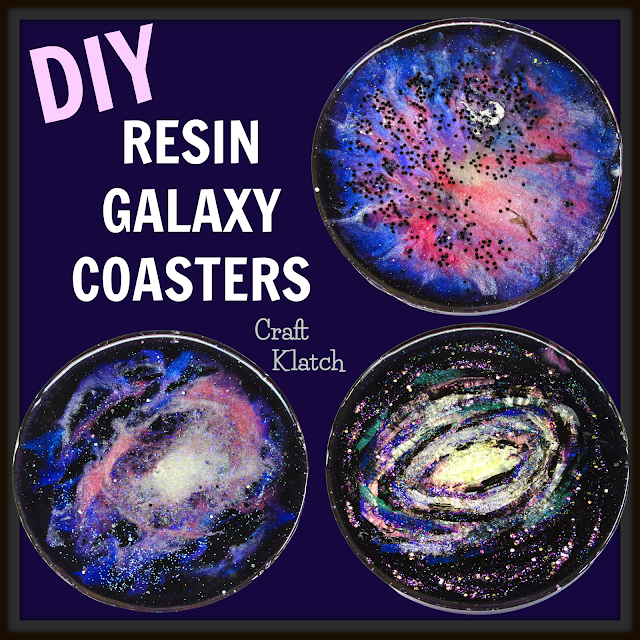 Pull them out of the mold and you have awesome galaxy coasters! Would this be able to be done over a series of days OR weeks instead of all in one day? Thinking about it for an after school program.